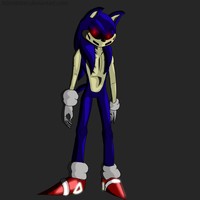 Something mainly for the fans of the Creepypasta "Sonic.exe"
THE CHARACTERS IN SONIC.EXE, X, EXETIOR, ECT. ARE NOT REAL! PLEASE DO NOT JOIN THIS GROUP THINKING THERE IS A WAY TO CONTACT ANY OF THE CHARACTERS! IT IS A WORK OF PURE 100% FICTION! NOTE: This fan group is mainly for fans of the original Sonic.exe and the reboot 'X', not exetior or anything like that. Please, please, PLEASE put your art in the correct folders! I can NOT stress this enough! The mods here can't do all the work. Sonic.exe (Exe for short or "X" by the Cult) is the main character of the Creepypasta of the same name and it's sequel and the overall main antagonist of the series. Sonic.exe is a supernatural entity from another dimension that greatly resembles Sonic the Hedgehog in many aspects, but is in fact greatly evil and powerful beyond scientific standard. He desires to cross over into the human world and make all of humanity his slaves for eternity. Sonic.exe was created by Sir JC the Hyena, who holds Exe in high regard, calling him "his masterpiece". Virus - My little closet friend - pg 28After a few seconds, it stopped. Everything went dead silent and Cream stood absolutely still. She heard nothing. She crept slowly towards the door, allowing the creak to disturb the silence. However, it wasn't fully opened. She soon returned to a statue as the paranoia crept into her. She could hear a raspy breathe filling the air. It felt very uncomfortable and horrific. Cream's anxiety for Vanilla inflated inside her. She had to go. Looking through the little slit in the door, she could make out what was what within the house. So far, everything looked normal. She opened the remaining of the door and stepped outside, only to discover that her bedroom door was closed. The little rabbit's heart galloped faster. She knew he was in there, just waiting for his prey. But she had no time to worry about her life; she was more concerned about her mother's one. Hey, real quick journal I've been meaning to write. While Exetior may be another version of X, he should not be confused for the original exe or 'X'. On top of that, this fan group is only for the original exe & X. Exetior is a fan spin off/re-imagining of the character and is not at all canon to the original or reboot storylines/universes. He does not need to be referenced or posted about here. Keep this in mind in future. Jul 3, 2015 For fucks sake..
Apr 29, 2015 For the love of God, is it really that hard? Hey, would it be okay if I could add my newest Sonic.exe art? if you're not already in the group then feel free to share the link(s) to your work so i can try to put them in for you! Thank you ^^ I'm technically a member of the group, but I just wasn't sure if I was allowed to add my art. Anyways, here's the link. of course you'd be allowed to submit stuff. if for some reason you're not allowed though, i'll bring up the issue to the admin so that we can fix it. The group isn't really active and even if we wanted to, I don't think our request would be accepted since no one who runs the group has been on DA in well over a year. I'm just gonna leave this comment here, just to give someone support here. For those of you don't know, a user by the name of SuperN100 or anonymousClaim is working on a Sonic.exe: Darkest Struggles fan game based on the reboot of the same name. first off almost at 1K great job keep up the great work!